This past week I created a brand-new dish. The fridge was getting a bit empty and I wanted Chinese takeout. So, I picked up the phone. Just kidding! I’ve given up all takeout and delivery for 2018 so a phone call wasn’t going to satisfy my craving. I grabbed meaty Crimini mushrooms, an eggplant and an onion. 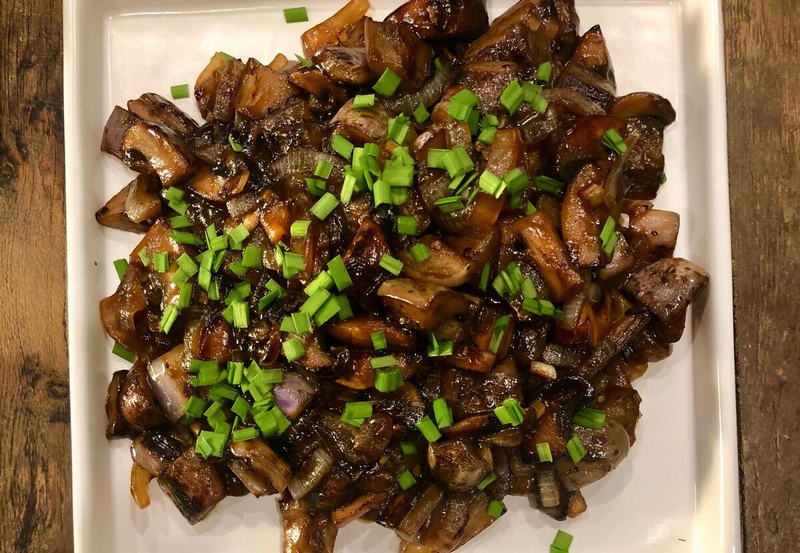 It may have lacked thinly sliced beef, crispy on the outside and meltingly tender in the middle, but the ingredients came together into a wholly satisfying meat-free Mongolian beef. This past Sunday at the farm market I debuted this new recipe to some pretty rave reviews. For a dish that comes together this quickly it is full of flavor. One market visitor asked me, “what makes it Mongolian?” The answer? Just kidding! It’s not really Mongolian at all. Mongolian barbecue is a style of restaurant cooking popularized in Taiwan starting in the 1950’s. The rich, brown sauce, onions and beef were supposed to be reminiscent of the sparser, heartier cooking in the mountains of Mongolia. This week you can serve up this delicious, healthy take on takeout at home. But watch out for the long list of ingredients and steps. Just kidding. Asian recipes often look like a lot of work, but most of the ingredients go into quickly made sauces and the steps are just a result of stir-frying. Rather than building up dishes starting with aromatics and layering in flavor until you arrive at a finished dish like so many western dishes, Asian stir-fries often prepare ingredients that cook at the same speed together in batches. The steps are just the result of ingredients going into and coming out of your wok or skillet. The truth about stir-fries is that by the time you’ve finished prepping your ingredients most of the work is done. So, grab a fresh eggplant, because summer is almost over, and hit the kitchen for a quick, delicious, home-cooked Chinese takeout-inspired meal. You’re going to love it. No kidding. Read through the recipe once. This looks like a lot of ingredients and steps, but you’ll find most of the work in prepping the vegetables. Once everything is cut up and the sauce is mixed together you’ve just got some quick cooking and dinner is served! Whisk together sauce ingredients with 1/4 cup warm water and reserve. Warm 1 tbs oil in a 12” skillet over med-high heat. Add eggplant and cook to brown, about 3-4 minutes. It will still be a little undercooked. Reserve. Return pan to heat with 1 tbs oil. Add mushrooms and cook until beginning to brown, about 3-4 minutes. Reserve. Return pan to heat with 1 tbs oil. Add onion and cook until beginning to soften, about 3 minutes. Make space in the middle of the pan and add remaining 1 tbs oil. Add garlic and cook until fragrant, about 30 seconds. Return eggplant and mushrooms to pan. Toss through and cook for 2 minutes to warm through. Add sauce to pan and toss through until it coats ingredients. Serve garnished with garlic chives. ← Robin meets… The boys from Glitterbomb! No more oopy, gloopy, summer salads!